The life of a beauty addict is one with many trials and tribulations. Uneven wings, broken powders and lipstick on teeth are just a few of the burdens us makeup junkies have to suffer. In my short time on this earth I've learnt a few tricks to make my life as a makeup lover as easy as possible and I wanted to share the hacks that I've learnt over the years that I hope save your life as they have mine! If I'm having an off day or just don't have the patience to risk messing up my wing, I use sellotape to ensure it's perfect every time. Never fear uneven wings again with this technique; it seriously creates that flawless, sharp finish and all beauty lovers crave. Simply take two bits of tape - no need for it to be longer than an inch or so - and stick then unstick them from the back of your hand a few times to make them less clingy. Then place both the pieces from the outer corner of your eyes where you want the line of your wing to be ensuring both sides are even. Then take your liner and draw your perfect wing, when you remove the tape the lower line will be sharp and your wings on point! This is one of my all time favourite hacks as it's always a bit disappointing when you have a to die for perfume but it doesn't last as long as you'd like. This is such a simple trick but it goes a super long way. Just rub a small but sufficient amount of Vaseline on all your pulse points where you'd spritz your scent. The Vaseline will prevent the fragrance from diffusing quite so quickly and mean you can rest assured that you're smelling sweet for longer. I've luckily never had the misfortune of having to try this beauty hack but some of my blogging pals have tried done this and the results that I've seen have been amazing. Since seeing them doing it I've always been eager to know the technique just in case it happens to me, and here is the method I pinned for future reference just to be on the safe side; better safe than sorry! This is one of my all time favourite hacks and for good reason! I have lots of baby hairs but I've also very fine hair so I have to be so careful when putting product in it not to weigh it down and make it appear greasy. Instead of loading my hair with gel or wax (just a tad too much can be disastrous), when I want to tame fly aways or my baby hair I take a disposable mascara wand and spray some hairspray over it. I then comb down the wild hairs with the wand and the spray keeps them neatly in place. I've even carried a spoolie and mini hairspray in my bag with me so I can keep my hair slick throughout the day and night. So simple, yet so effective. Putting eyeshadow over your light roots to match your dark hair is something I've always seen my friends do and hear about but unfortunately I've always had dark roots on light hair so I've never been able to try it myself. It works in a similar way to using powder or eyeshadow in your brows and clings to the hair in a way that looks natural; perfect to keep you going while you get your hairdressers appointment booked! If like me you have dark roots growing out of light hair, dry shampoo is great for concealing darker roots. Not only will it make your hair feel fresh and volumised, but also polished if your roots are a little on the obvious side! I was told this trick years ago in this weirdest situation; I kid you not, a random woman came up to me in the street and just decided to pass this wisdom on to me. I ain't complaining but it was strange at the time! Cut the teeny tiniest (literally 2mm) bit off the ends of your hair and then pick them up with an already coated mascara wand and apply your mascara as usual. The hairs will blend into your lashes naturally and hold for the whole day until you remove your makeup. Everything happens for a reason right? That woman must of told me all those years ago before I even had a blog so I could pass it on to you! I always see shiny gloss on other people and think it looks amazing but on myself I just never think it suits me! If you feel the same about shiny gloss or just fancy toning down your favourite one for the day, dust a matte translucent powder over your lips to make the finish slightly less shiny. This is great for giving your products multiple purposes and means even if you love the shade of a gloss you won't have to compromise on using it if you fancy it being a matte shade for the day. Y'all know how I love my natural oils? And also luscious lips. 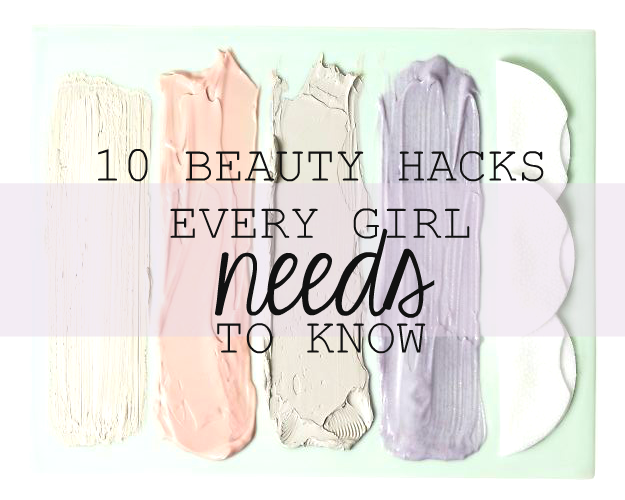 Well, take your Vaseline, lip gloss or even chap-stick and mix a little peppermint oil with the formula. This creates a plumping effect when you apply it to your lips, which is a simple, natural and completely safe way to get fuller lips instantly. Plus you'll smell minty fresh. You can thank me later. Yes you read that right. I didn't know this until recently when I took off my white top only to see an orange spot on it where my nose had made contact when I was taking it off. I tried the old wash under the tap method but it was still lingering a bit on the material so after a quick Google Search I learnt that shaving cream is what I should be reaching for when I make a mess with makeup. I have no idea why shaving cream works, but it just does! I can't argue with it! Whilst it's super easy to quickly check your teeth in a mirror while you're out and about to inspect for lipstick marks, there's an even quicker, more subtle way to remove the lipstick marks on your teeth. Put your finger in your (closed) mouth and pull your finger out to get rid of any lippy transfer on your teeth. Do this before going into an interview, meeting your friends or just before arriving at your date to ensure your pearly whites are flawless, just make sure no one sees you. Love these! I've been doing the lipstick thing for ages now and I've not had the 'lipstick on teeth' problem since (so I can now wear that red lipstick to go out without fear of looking like an idiot) haha. Loved the vaseline tip, thank you!! I'm SO trying out the sellotape tip for my eyeliner tomorrow! I'm definitely going to try the sellotape trick! I always see it used for that super angular eyeshadow look but i've never tried it for liner! I've only just learned the vaseline trick for perfume but it really does make my perfume last so much longer - I'll definitely be trying some of the others! Such a brilliant post, I love these tips!